—from George Gilchrist’s introductory remarks to Darwin Across the Disciplines. Faculty at the College of William and Mary observed Darwin Day with a symposium titled Darwin Across the Disciplines. The event was held on Feb. 12, 2009, the 200th anniversary of the birth of Charles Darwin, in the Sadler Center’s Commonwealth Auditorium. The presentation was videotaped, as was a sometimes provocative question-and-answer session. Friday, March 20 at 5 p.m.
Saturday, March 21 at 2 p.m.
Sunday, March 22 at 2 p.m. The show may also be viewed on the City's website on the same schedule. The program will also air on James City County local cable channel 48 in April - specific dates and times TBA, check their website for updates. The symposium featured short presentations from faculty experts in fields ranging from biology to philosophy to religion. George Gilchrist, Marjorie S. Curtis Term Distinguished Associate Professor of Biology at William & Mary, moderated the session. A panel discussion will follow the individual presentations and the event will conclude by involving members of the audience in a moderated question and answer session. George W. Gilchrist (Biology) gives a short introduction to Darwin's key theories, common descent and natural selection and points out the importance of evolutionary science for medicine and public health. Gregory A. Wray ’81 (Biology, Duke University) discusses the influence of Darwin's ideas within the biological sciences, in particular their impact on studies of embryonic development. Barbara J. King (Anthropology) talks about humans’ common ancestry with apes, then will consider the strengths and limitations of applying evolutionary science to an understanding of human behavior. 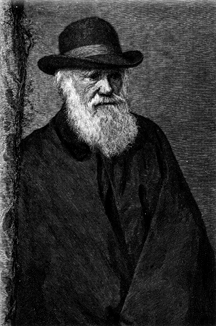 Paul Davies (Philosophy) describes two ways in which Darwin has been adapted to contemporary philosophical reflection. Rowan Lockwood (Geology) explains the impact of the fossil record on Darwin's ideas and vice versa. Topics include the quality of the fossil record, transitional fossils and graduated vs. punctuated change. Lee A. Kirkpatrick (Psychology) explores the history of evolutionary ideas in psychology, focusing on the recent emergence of evolutionary psychology as a paradigmatic alternative to extant (non-evolutionary) approaches to psychological science. George Greenia (Modern Languages and Literatures) speaks on linguistics and the debate about how language itself emerged as an adaptive trait, and also how the language of evolutionary biology might guide us in understanding how real languages change over time. Jeanne Wilson (Organizational Behavior) discusses organizational ecology, the branch of organizational science that tries to explain how business conditions affect the diversity of organizational forms that survive and persist. She will address the controversy over whether survival of populations of organizations is primarily due to selection or adaptation. John Maxwell Kerr examines a few aspects of the impact of Darwin’s theory have affected theology and theological ethics. Time constraints restrict his observations largely to Christianity. Kerr is the Episcopal chaplain to William & Mary and is a founder of the Society of Ordained Scientists.